My wife loved the new travel kit!! I'm able to place all my meds and personal items in it. great item for travel. My wife really likes it because she travel a lot for work but it was too big. So unfortunately we had to return it. I’ve bought three of these travel organizer as gifts. I fill them full of travel size products specifically for the recipient. These are perfect for the college student, business traveler and even high school students on the go. I ordered just before a 3 week cruise. Like the ease not having to pull out makeup and put away each time. I would have liked the dividers to have been wider for compact size makeup. The one open part is not enough if you have more than one powder or blush. gives me a great, organized work space even in a crowded space. It is absolutely amazing how many items I can store in this organizer. I take photos on how I packed my items so I don't forget how I optimized the storage. Once filled, it's a little heavy and doesn't work well for airline travel, especially since you have to declare liquids in another bag going through security, but if you don't use anything liquid, it would work well. I use it all the time for weekend trips. Some places we stay have no counter space, so this works great. I would highly recommend it! I love this travel organizer! I travel a lot and take all my favorite makeup, moisturizers and more with me, and this is my favorite over all other travel products I've purchased. Great size with convenient compartments to hold each type of product instead of all in a jumble. I just unzip it, flip it open and everything is there without unpacking so convenient and a bonus at the end of my trip...just zip it back up! I would highly recommend this organizer. Fantastic product and fits well into any size suitcase. 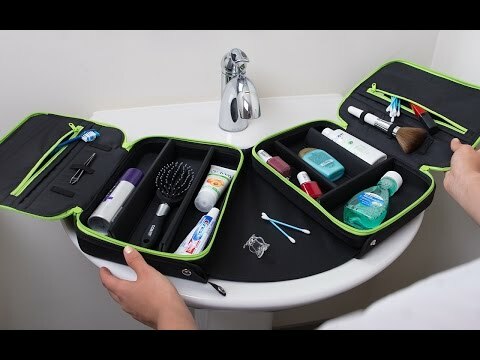 With its customizable compartments and hidden work surface, Everything ORGO is much more than an expandable cosmetic bag. It’s a whole system to organize and keep track of makeup, toiletries, jewelry and more. The most unusual feature is its built-in counter space that fits securely over your sink. When you unsnap and slide the two sides open, you’ll create a surface area that keeps your stuff where you can see it—and stops it from falling into the sink. Removable inserts, zipper pockets, and elastic grips let you configure the inside just how you like it. Add or detach lightweight dividers depending on your storage needs and your affinity to nooks and crannies. Maker Diane Copek created Everything ORGO to streamline her travel. But this light, compact, and expandable design works whether you’re at home or on the go. Use it to organize craft supplies or camping essentials. Or keep all your necessities together (and separate from your roommates) if you share a bathroom.